To you, a crowded area is a burden. But to a pickpocket, it’s a playground… And you need to safely guard your belongings from them. Or else, you might notice that your phone’s gone the second after you used it. Luckily, this multi-functional, anti-theft backpack has got you covered! It might look like any normal bag, but that’s the point — so thieves can’t find the hidden pocket! With a quick glance, nobody can. And when you’re wearing it, no one can open it either. Why? Because this hidden pocket is on the back side of the bag. So instead of the zipper being exposed, it’s hiding close to your body. Making it nearly impossible to open without having to take the backpack off first. Amazing! 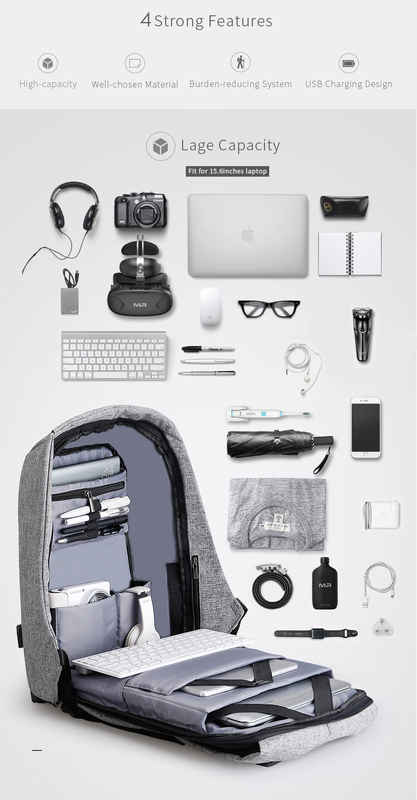 Specially designed with the commuter/student in mind, this bag contains an external USB charging hole. As well as ample space for storing your laptop, tablet, books, clothes, and other valuable items — all inside a cushioned foam, protected with waterproof, cut-proof, nylon fabric. Protect your valuables from those who are up to no good! And keep them in good condition by clicking the “Add To Cart” button above now to get your anti-theft backpack!